Fat Quarter Shop's Jolly Jabber: Bertie's Back! Bertie is back, and this time he is all bundled up and ready for winter! It's amazing what one little bird can do with Maywood's Woolies flannel, thread and a button or two. Following one of our favorite BOMs from last year, Bertie's Year, designer Bonnie Sullivan has created a new seasonal quilt for us to enjoy. 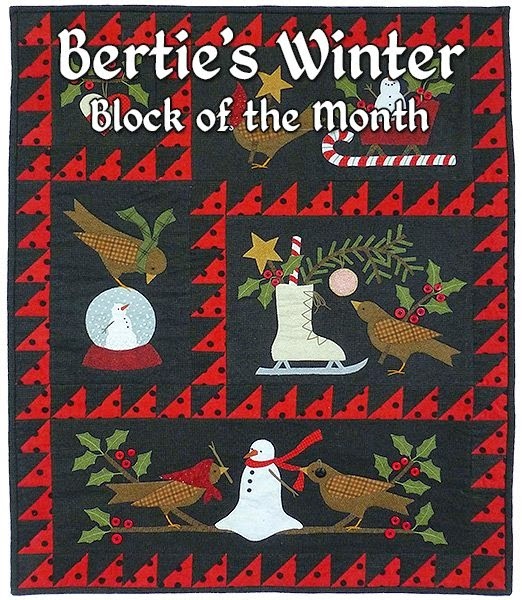 For our Bertie's Winter Block of the Month program, each month you will receive a pattern and Woolies flannel and Shadow Play flannel to complete the 28" x 34" quilt top, binding and backing. The Bertie's Winter BOM button, bead & thread pack are sold separately The program runs from July 2014 to October 2014! Watch Bonnie Sullivan and Kimberly talk about Bertie during the Spring 2014 Quilt Market and don't miss Bertie's eventful winter and sign up today!